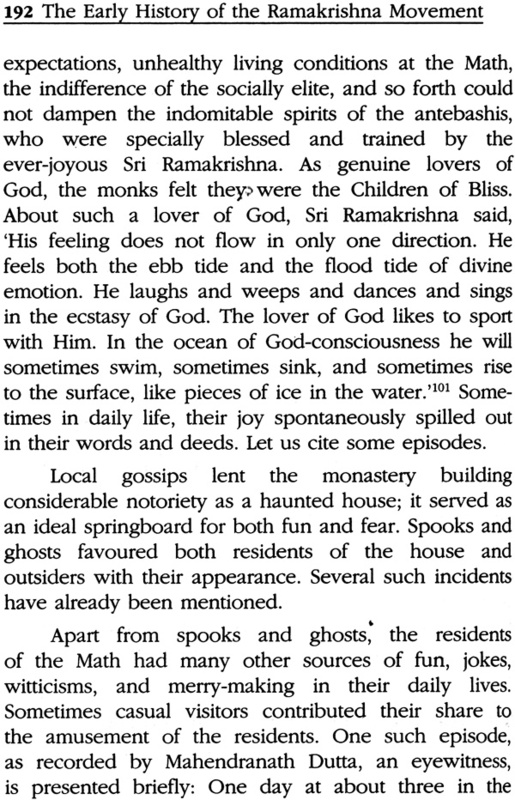 As in the case of the glacier Gomukj which gave birth to Ganga there welled out of Sri Ramakrishna a springtide of thoughts and a vast spiritual energy. A new stream make its way through a channel before it gains volume and strength and makes its way across the plains. The Ramakrishna movement has supplied that channel for the good of humanity. History and its characteristics have been rigorously examined many a time on various counts. 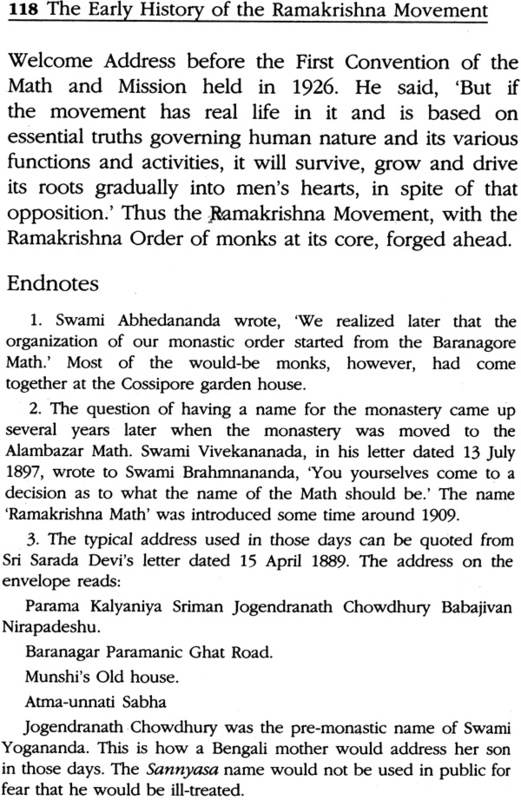 As one tries to grasp the early history of the internationally reputed Ramakrishna Movement, one is confronted with a host of anecdotes, events, legends and the like, at times contradictory to one another, that have filtered down since its inception over a hundred years ago. 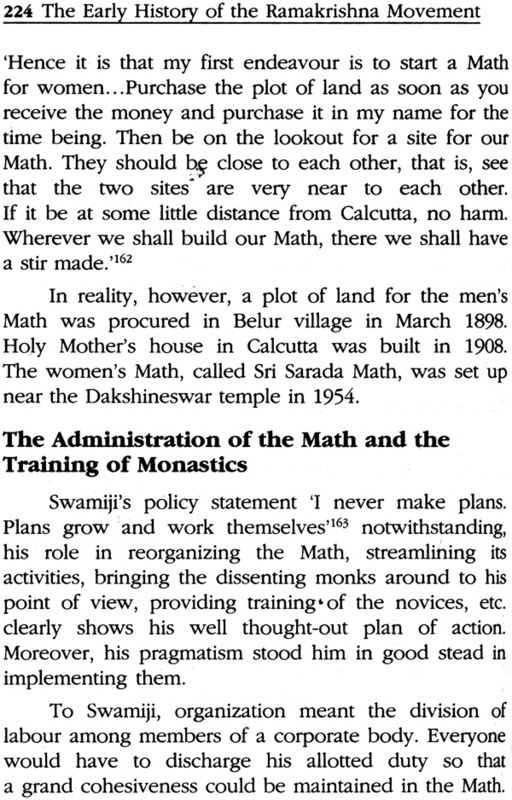 Again, to get at the then existent ground reality scholars disagree in their approaches enough to confuse ordinary readers, particularly since the theme centers around religion, particularly an Indian religion, and its adherents. In any case, history, proud of its emphasis on objectivity, has to he something more than an anthology of filtered rumours. When we focus attention on a particular point in the field of vision, some basic question crops up. Two contemporary intellectuals, Thomas Carlyle (1795-1881) and Ralph Waldo Emerson (1803-82) made two interesting statements. 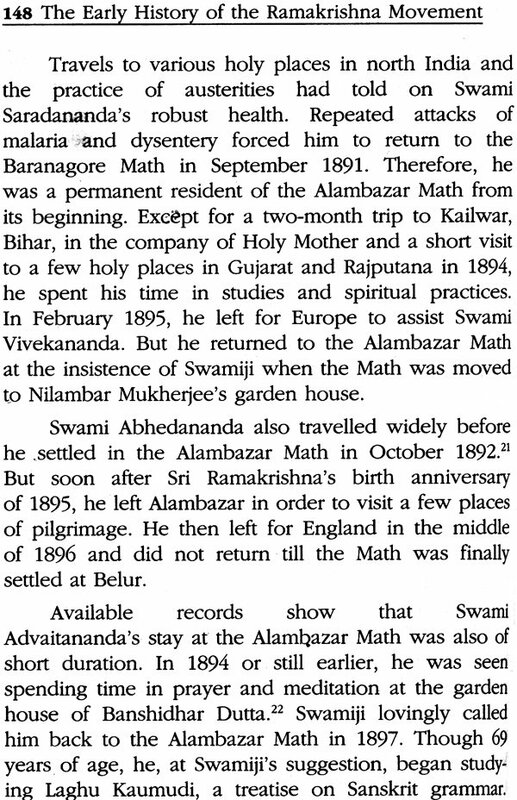 The former stated, History is the essence of innumerable biographies.’ The latter lamented, There is properly no history, only biography.’ Here the question is: How can we isolate history from biography, particularly when the topic for exploration is the early history of a religious movement? However, without going into the niceties, we have attempted here to place before the readers an honest account of past events leading to the Ramakrishna Movement of the first decade of the last century. The Ramakrishna Movement originated from Sri Ramakrishna, an illiterate but spiritually enlightened Brahmin, who appeared on the scene in Calcutta, the then capital of British India, and captured the attention of people who mattered. The story of his life was as moving as were his teachings. Though he apparently lived a simple life, scholars and spiritual seekers found in him an invaluable treasure trove of spiritual values and a promise of improving the quality of human life. 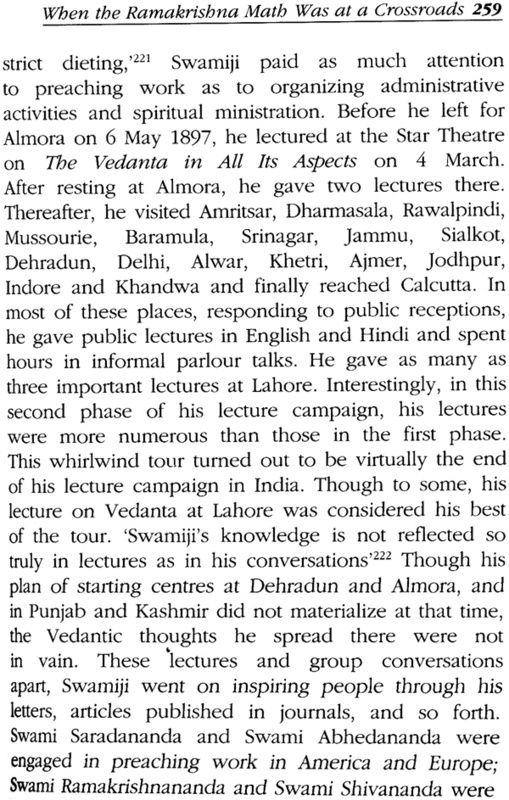 Even as a modern intellectual may find it difficult to estimate the worth of a man like him and his teachings, Swami Vivekananda pleaded: It does not matter whether someone considers him a man or a spiritual teacher or a God-man, but let all pay attention to his teachings which were but a commentary on the unique life that he lived. The beginning of an organization or a movement, though tender and apprehensive of dangers and uncertainties, is full of promise. 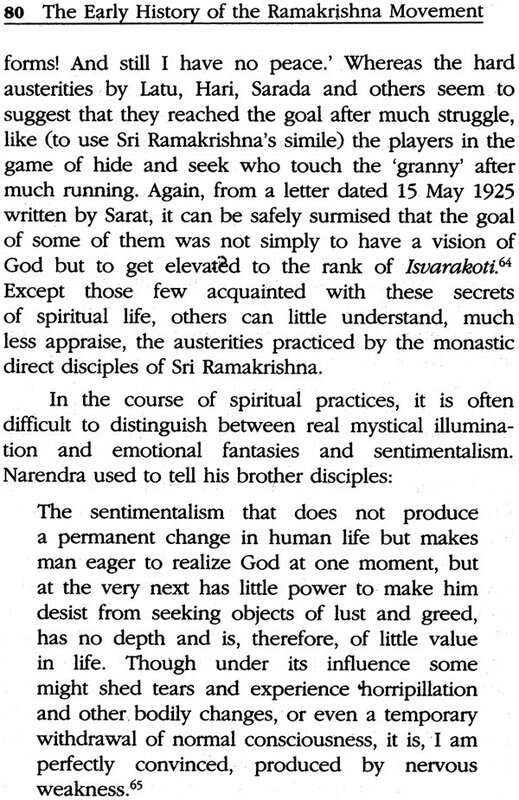 And as expected, the narratives of the early days of the Ramakrishna Movement have a touch of romance and sparkle. It was the mysterious Sri Ramakrishna who inspired the important religions movement known as the Ramakrishna movement, mysterious because our social standards fail to understand him, much less assess him, hut none could ignore him. That is why his life story has been described as the story of a phenomenon—a fact or event that is perceived by the mind, especially one whose cause or explanation is in question. To obey the divine commands he received towards the culmination of his spiritual disciplines of twelve years, he dedicated himself heart and soul. One of the commands was to set up a community of like-minded people. He gathered them, trained them, and launched his mission. 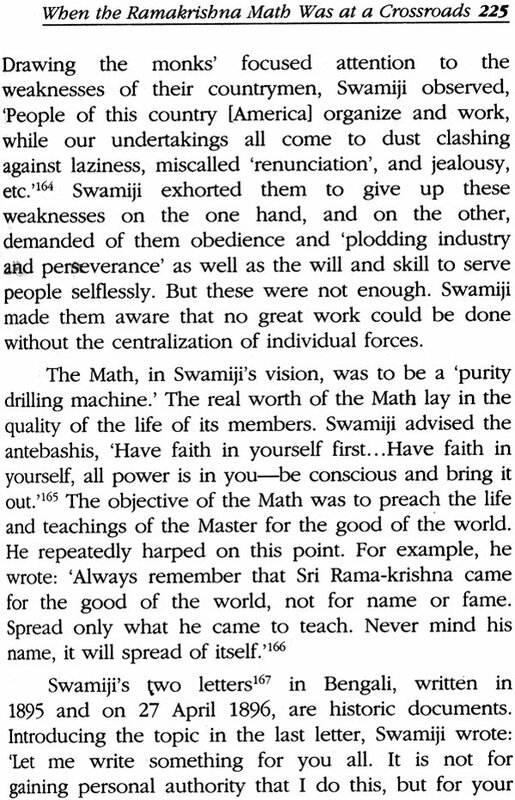 The present humble work is an honest attempt to briefly study how Sri Ramakrishna’s mission proceeded—particularly during its early years—towards fulfilment, and in the process how the Ramakrishna Movement grew and developed in the early days. 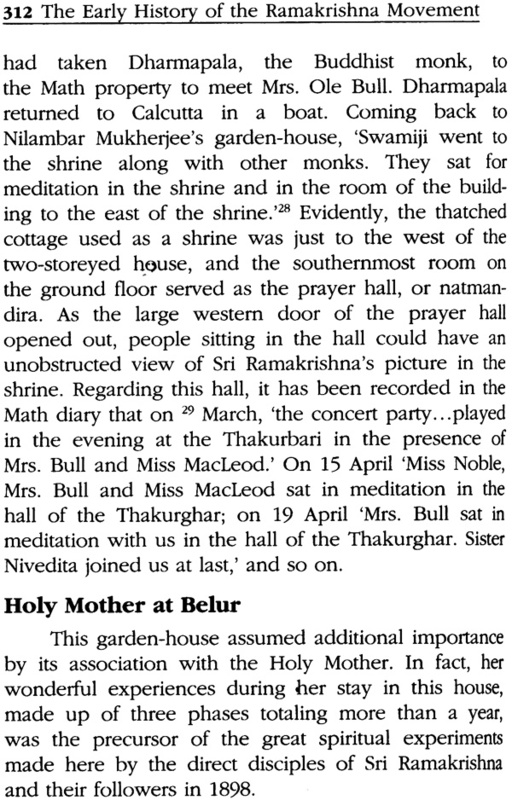 All the chapters of this volume except the first one were published in the reputed journal the Vedanta Keshari over the years; and the chapter entitled An Epitome of the Baranagore Math, constituting the epilogue of this volume, was separately published in the well-known journal Prahuddha Bharata. 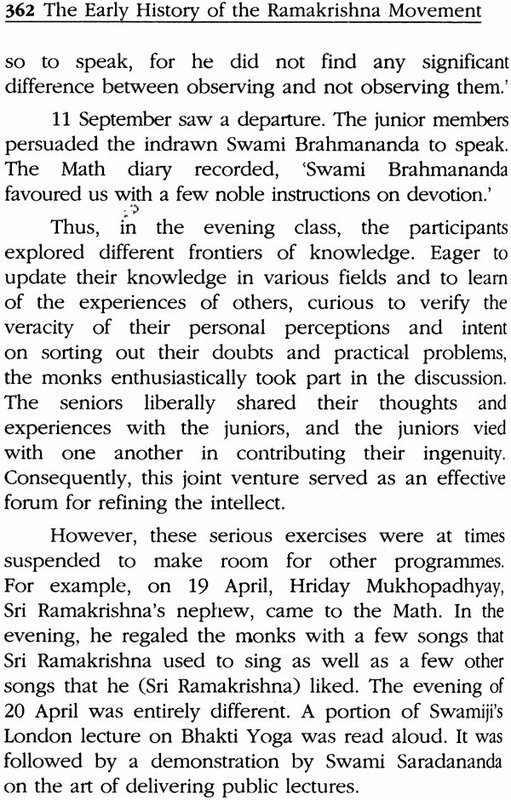 The first chapter of this volume is an adaptation of the last article, entitled The Ramakrishna Sangha, of the author’s book More about Ramakrishna. The chapter entitled The Permanent Home of the Ramakrishna Order at Belur is an adaptation of a chapter of the author’s hook Belur Mather Adi Katha written in Bengali. As they were written as independent articles, a few minor repetitions appear. The authour is grateful to Mrs. Anna Monday, of Northern California who took the trouble of editing and reorganizing the materials into book form. 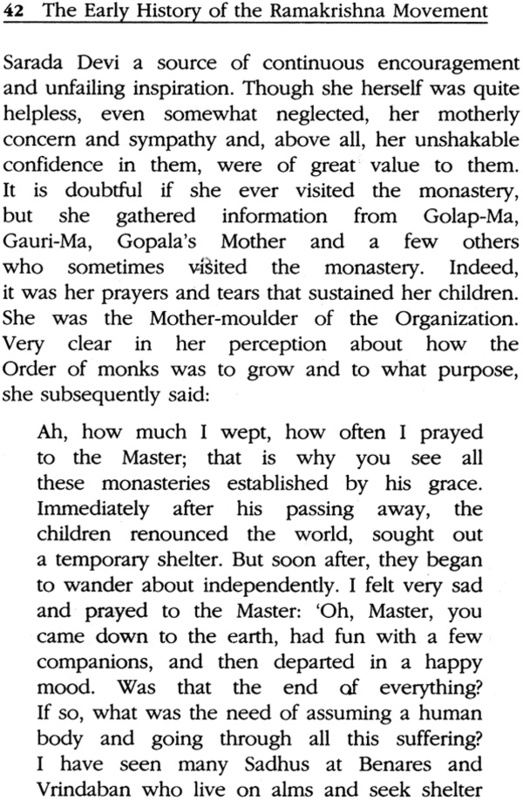 We offer this volume as a token of our humble homage to the Holy Mother, remembered as the Mother-moulder of the Movement, on the occasion of her 150th Birth Anniversary celebrations.